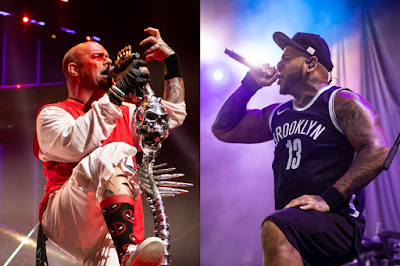 As their huge North American tour comes to a close, Ivan Moody brought out members from Breaking Benjamin, Nothing More and Bad Wolves onstage for a brief awards ceremony to thank each of the bands for rocking North America with Five Finger Death Punch. After handing them off to Benjamin Burnley of Breaking Benjamin and Jonny Hawkins of Nothing More, Moody had a few special words for Bad Wolves vocalist Tommy Vext. "Now, before I give this to Tommy, I want you guys to thank him for helping me out at a time that nobody else gave a f**k."
Moody, who has struggled in the past with alcoholism, has remained sober after seeking professional help. Vext, who has also dealt with substance abuse, launched a non-profit to encourage others to seek help on a grander scale. It was announced that Vext will also be the recipient for the "2018 Rock To Recovery Service Award" thanks to his hard work helping addicts on the road to recovery. Vext wrote on his Instagram, "Tonight was a touching end to the greatest tour I’ve ever been a part of. Kind of serendipitous we would end the tour in the city where A.A. began. So here’s to miracles and second lifetimes brother."